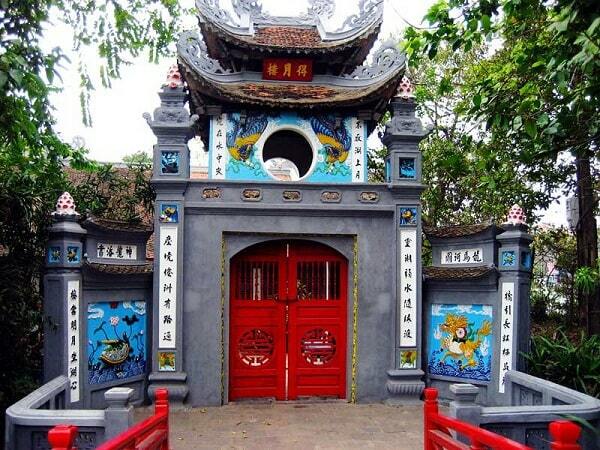 "Ngoc Son Temple is an interesting temple on an island in Hoan Kiem Lake in Hanoi. It is right near the famous roundabout, and you need to cross the iconic Red bridge leading to this temple in the middle of the green lake. Entrance fee is 3000 dong per person. This temple truly makes you feel a sense of peace and tranquility from the bustling streets of Hanoi, it's located right near the roundabout within the lake. It's a lovely place to visit religious or not just to get a sense of culture and see a lovely bit of history." 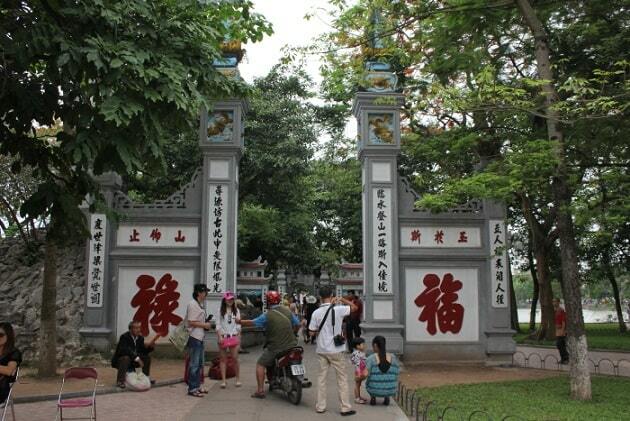 The Ngoc Son Temple - is peaceful and quiet on a picturesque island in Hoan Kiem lake, near the center of Hanoi. It's a place to get away from the bustle of the city. The island on which the temple was built, is known as the Jade Island. It is accessible by the iconic Huc Bridge of the Rising Sun Bridge. 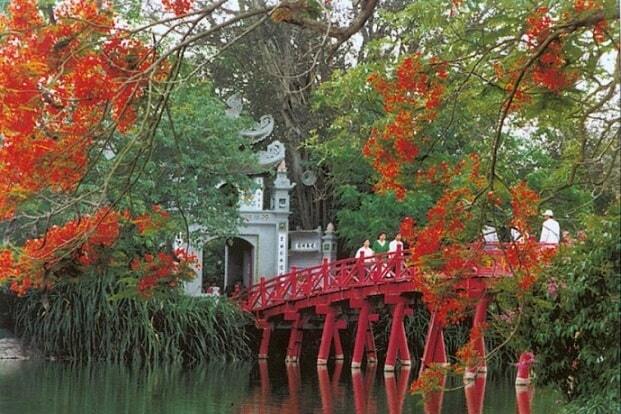 It is a charming-scarlet (red) painted wooden bridge classic Vietnamese style. The temple attracts many visitors and was built to commemorate the 13th century military leader Tran Hung Dao, who was known for his bravery in the battle against the Yuan Dynasty. Ngoc Son Temple was built in the 18th century on Jade island in the center of the "Lake of the reversed sword" or Hoan Kiem Lake. The story goes that the emperor had received a magical sword of the Golden Turtle God (Kim Qui) to chase away the Chinese. After successfully chasing away the Chinese invaders, the emperor sailed on Hoan Kiem Lake when a giant turtle surfaced and took the sword from him and disappeared into the depths. The sword was never recovered. On the island in the lake stands the stone Turtles Pagoda. You can admire here a turtle that was fished out of the lake in 1963. According to expert the turtle was 500 years old, or from the time of the legend! Also within the pagoda is a large bronze bust and other gods. There are altars dedicated to Tran Hung Dao and some ancient artifacts, including some of ceramics. There are also endangered large soft-shell turtles, which are swimming in the lake and if you see one of these gentle giants, that will bring you happiness. The temple is still used as a prayer place. You can see here how the monks are praying. You can smell the smell of burning incense. There are several buildings on the island, which you can view as the Pen Tower and Dac Nguyet Lau Pavilion, Pavilion also called for Moon Reflection. Check out the Martyr's Memorial, next to the temple and take a moment to those who gave their lives during the struggle for an independent Vietnam. Ngoc Son Temple is built in the traditional Vietnamese style and has one of the most impressive entrance gates of the city. "It's located on the lake and gives some lovely views across the area. That being said, you can get similar views from anywhere around the lake - and that's free! The red bridge is also accessible without needing to buy a ticket. There's not much inside other than the main temple itself and I didn't spend more than 15 minutes here after taking some photos and relaxing. "